The past month has been one of the craziest months of my life, the response to The City of Kings has been amazing and I’m so pleased to see the game being played and enjoyed by thousands of people all around the world. The game sold out far quicker than we ever imagined and I’m receiving countless messages from people trying to track down a copy. I’ve been working with our manufacturers and shipping partners to come up with a plan, and today I’m happy to share it with you. 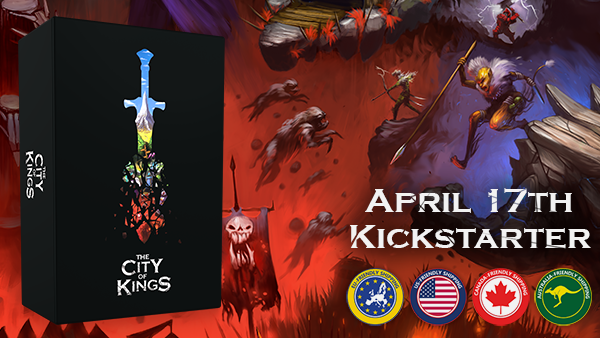 The Kickstarter will include the Adventurer (retail) Edition and Deluxe Edition of The City of Kings. We will also be offering all the accessories and addons which were available during the original Kickstarter, allowing you to pick and choose any combination you want. In addition to the existing options, you will be able to pick up some new stories, scenarios and a few special things which will be announced in the coming weeks! My goal has always been to grow the world and offer you options to pick and choose from, and this second Kickstarter will reveal the first steps of this plan. There will be plenty of updates coming out over the next few weeks and I’m always happy to answer your questions over on Board Game Geek or Facebook.